Hosted by the Ngara Institute, the 2018 Ralph Summy Annual Lecture features former President of the Human Rights Commission, Professor Gillian Triggs. Professor Triggs is widely respected as a staunch advocate of human rights, particularly in relation to those refugees who have sought sanctuary in Australia. Professor Triggs’s determination to ensure that Australia complies with its international obligations has frequently brought her into conflict with government ministers. Throughout these difficult times, she has shown great tenacity and dignity in the face of often very hostile attacks. Widely admired for her courage, Professor Triggs has long called for Australia to adopt a Charter of Human Rights, a move that would bring us into line with many other nations. The title of her lecture to be delivered at the Mullumbimby Civic Hall on 30th June, at 6.30pm, is: “It’s time for an Australian Bill of Rights”. 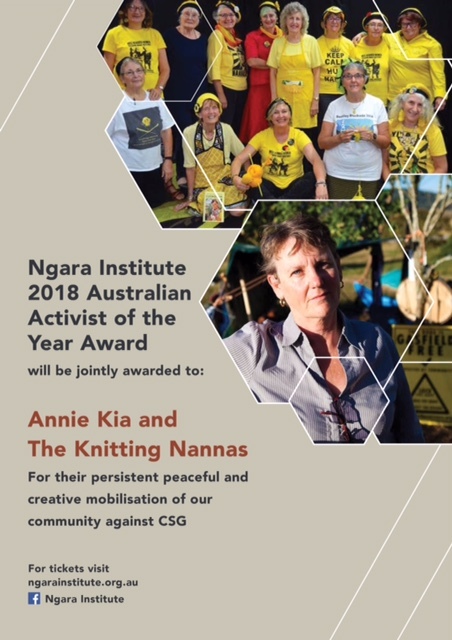 Professor Triggs will also present the 2018 Australian Activist of the Year Award to activists who have fought long and hard against Coal Seam Gas extraction in NSW: Annie Kia and the Knitting Nannas. The evening will also include music, and food and beverages will be available for purchase from 5.30pm when the doors open. The event will start at 6.30pm.